U.S. Muslim congresswoman Ilhan Omar had been the target of a bomb threat while she was at a conference in Los Angeles, according to the news site The Blast. Omar spoke at a banquet for the Council on American-Islamic Relations' Los Angeles chapter last month. A few days before her speech, the hotel where the event would take place received a call in which a woman threatened to bomb the hotel for letting the congresswoman enter, according to court documents obtained by the news site. "What would you do if I told you your hotel was going to be bombed. That is exactly what's going to happen if you allow the likes of Ilhan Omar into your hotel. She is a danger to American society and your hotel. You are not to allow her foot into there if you value your own safety. Do not allow her in there. Cancel the event," the woman said in a voicemail to the hotel, The Blast wrote Wednesday. Police is investigating the incident and are planning to extract mobile phone information from the caller in order to find the suspect. Despite the threat, the Minnesota lawmaker proceeded to speak at the event that had been also met by dozens of protesters outside, a part of the ongoing criticisms and attacks she has faced since she made comments criticizing Israel, which some saw as being anti-Semitic. "I want to talk about the political influence in this country that says it is OK for people to push for allegiance to a foreign country," Omar said at a progressive town hall meeting earlier this month, referring to Israel. The remarks received widespread and bipartisan backlash, with some in Congress labeling them as anti-Semitic. 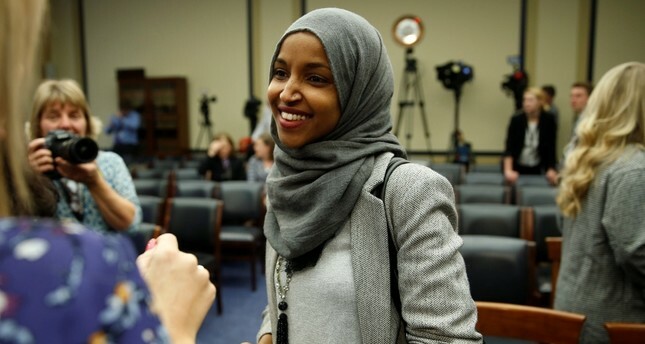 Omar apologized for similar comments, but this time she doubled down, saying she has "not mischaracterized our relationship with Israel. I have questioned it, and that has been clear from my end. "Two of my first acts as a Member of Congress were to cosponsor a bill elevating the position of Special Envoy to combat anti-Semitism—and my first op-ed after my election was on the rise of hate crimes," she tweeted. "White supremacist violence is on the rise globally. Right-wing extremists killed more people in the US in 2018 than any year since 1995. Anti-Semitic violence accounted for 58% of religious hate crimes," she added.